Wouldn’t you prefer your employees spend their time working, rather than tracking? With every minute impacting your bottom line, it’s time to optimize your timekeeping. Your staff needs instant and convenient access to time cards, schedules and time off requests. Empower employees with mobile. 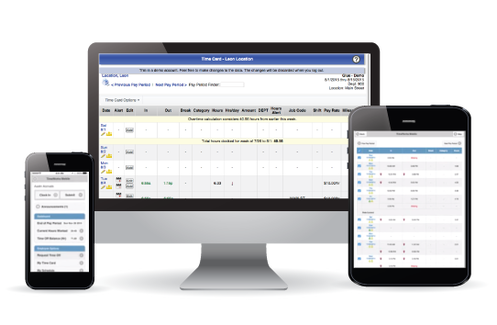 Save countless hours planning and adjusting schedules with automated scheduling. Managing shifts has never been easier. Automated timekeeping is the best way to reduce the cost of labor. But there are more benefits than just cutting labor and administrative costs. Combine the latest in time clock technology with industry-proven, cloud-based time and attendance services. Automated timekeeping simplifies payroll in so many ways for HR, supervisors, and even employees. Cut hours of stressful administration into minutes of convenience. Take a look at just a small sample of the time-saving tools. Contact us for a live demo or request a free 30-day trial.